Which Stones Can Help Calm By Black Lab During Rain Storms? What stone or stones would help calm my 16 year old black lab with rain storms? Apparently she can sense/feel when a storm is coming because she will run around in the yard becoming stressed/agitated and will continue doing that, even in the rain until the storm/rain is over. She has a covered bed on the porch to keep her out of the rain but won't get in it until storm is over. I feel so bad for her, especially at her age still going through this, she is totally exhausted. Any information would be greatly appreciated. Thanks! Rose Quartz can give animals a sense of security and peace. It has a calming energy that can benefit hyper cats and dogs. 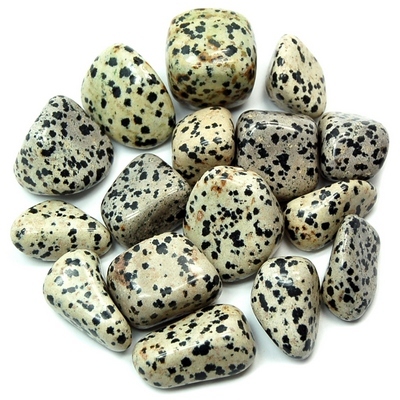 Dalmatian Jasper is beneficial for animals and tends to have a calming effect. The energy from this crystal will balance the emotions and help the animal maintain composure. Blue Calcite is a good crystal to turn to when your dog is acting up. This blue crystal can help to calm the animal and can have a positive effect on their disposition.